The USS CLEVELAND (LPD-7), the fourth Austin class amphibious transport dock, was commissioned on 21 APR 1967. Built by Ingalls Shipbuilding of Pascagoula, Mississippi, CLEVELAND was commissioned at the height of the war in Viet Nam and steamed there repeatedly early in her career. As time passed after the war CLEVELAND continued deploying to the Western Pacific and else where as needed. In 1988 she sailed to Alaska to assist with the Exxon Valdez oil spill in Prince William Sound, in the 1990s CLEVELAND supported counter-narcotic interdiction in Central America and has deployed to the Indian Ocean against the War on Terror numerous times. 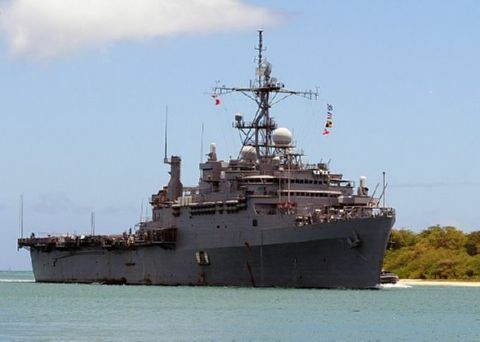 USS CLEVELAND serves her country from her homeport of San Diego and is tentatively slated for September 2011.